These affordable & luxurious serviced apartments in Sydney are set on the shores of the lane cove river and offer great value short stay accommodation to small and large families and to anyone wanting the comforts of a home away from home. These affordable & luxurious serviced apartments are situated close to Chatswood and Artarmon and only minutes by bus or car to centre of Sydney. If you’re looking for a conveniently located serviced accommodation in Sydney then get in touch. Our serviced apartments in Sydney come with great value! 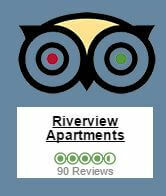 Read reviews of Riverview’s Executive Sydney Apartments from TripAdvisor – World’s most trusted travel advice. See why we’re the best choice for serviced apartments Sydney. Still seeking more information about our apartment services? “Very neat apartment with good location. Relaxing atmosphere and silence. The room and kitchen are fully equipped and serviced to a high standard. Every amenity was supplied. My husband myself and our daughter stayed in this modern beautifully appointed and extremely private apartment. …[we] Really enjoyed our stay here. We recently stayed at the Riverview Apartments with our large family of 10. We would highly recommend these apartments. They are beautifully furnished and extremely comfortable for families. The location was great with bus links to the city and easy access to Sydney attractions. Thanks again Paul for all your help with accommodating our large group.